Manchester United are reportedly in talks to sign as many as three players in a sensational £109million raid on Serie A giants Napoli this summer. Various reports have linked the Red Devils with Brazilian-born Italy international Jorginho for some time now, with the £50m-rated ace also a target for the likes of Liverpool, Arsenal and Manchester City. 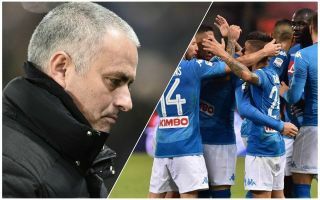 However, it’s now being claimed that United are working on deals for two other players from Maurizio Sarri’s impressive side who really ran Juventus close in the title race this season. Il Mattino (translated via 101greatgoals) report that United are working on signing talented left-back Faouzi Ghoulam for £35m, while Sport Witness also claim Belgian forward Dries Mertens is on his way in a £24m deal. This would be utterly ruthless business by Jose Mourinho, who certainly needs to strengthen this squad with signings in defence, midfield and attack. Finishing a whopping 19 points behind Manchester City this season, it’s clear strengthening is needed in a few key areas and United seem set to raid Napoli to do it. With Napoli boss Sarri also being linked with Chelsea and other top clubs it could be a very difficult summer indeed for the Italian giants.